In front of computers and cameras, kids are kneading the clay, cutting up colored paper, and making joyful sounds. It looks like they were able to make something that was better than expected. - At the digital animation workshop. My group has been doing such activities all over the world, from developed to underdeveloped countries. From setting characters, storyboards, story, composition, dialogue, to editing; everything is done by children. Not only do they make things, but they also show their works to parents, teachers, and friends, or people who they do not even know, at the workshops or on the Internet, receive feedback, communicate, and think. 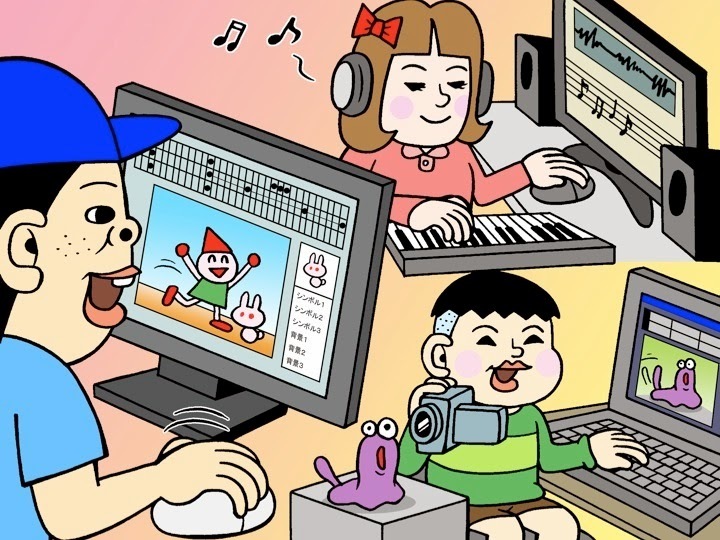 Partnering with the Keio University and MIT etc., the NPO, “CANVAS,” which I established 12 years ago in 2002, has provided the places of creation and expression for children in the digital age. So far, they have offered 3,000 workshops to over 300,000 children. Making animations, films, and games - Virtual communities are also provided online to share, match, and play lyrics that they wrote and music that they composed. There are activities to send out information of local areas where they live by utilizing blogs, newspaper, and media. I want to expand these opportunities of workshops. I have also been working at the University of Tokyo and the Waseda University. I have been developing packages that put know-how and the materials together. They can be applied in increasingly more various environments, such as elementary and middle schools, kindergartens, pre-schools, nurseries, and amusement facilities. This is not just in Japan. There are activities in diverse places; such as Paris, Bologna, Cambodia, Sao Paulo, and Seoul. Originally, I was developing media for children at the MIT Media Lab that I worked for but I am using and deploying it in the actual fields. Recently, I have been working together with Google and focusing on the promotion of programing education. Japanese workshops are high-quality by international standards. This is a result of 12 years of efforts. On the other hand, in the U.S and Europe, there are children's museums that offer hands-on learning everywhere. Their collaborations with schools are strong and their programs are included in school curriculums. Such arrangements are still not very common among schools in Japan. Therefore, we started the movement of digital textbooks to spread the power of digital media to schools. The goal is “for every child to be able to make animations and compose music.” I think it is about time to move onto school education from private workshops.